One of the many advantages of working in a special collections library is the opportunity to browse in the stacks. I regularly browse while checking the climate control monitors throughout the building. During one such walk-through, a suede binding resembling a typical Roycroft cover caught my eye. I lifted Essays of Elia (1899) off the shelf, located the publisher’s identity, and discovered that my hunch was correct. This, in turn, lead to a search in the library catalog for more Roycroft materials and the realization that the Boston College Libraries hold a number of books made by the Roycrofters. My colleague, Andrew Isidoro, and I then used these materials to produce the current John J. Burns Library exhibition, Dreams of Art & Glory: Book Craft by the Roycrofters. Elbert Hubbard (1856-1915) was the founder of Roycroft, a reformist community of craftspeople and artists in East Aurora, New York. He referred to himself as an anarchist and socialist. Hubbard began the community in 1895, influenced by the ideas of William Morris, the well-known English designer, printer, and Socialist. William Morris was known for his decorative arts—including tapestries, wallpaper, fabrics, furniture, and stained glass windows—and founded the Kelmscott Press in 1891. His aesthetic was a major inspiration for the Arts and Crafts movement, which began in England in the 1880s, and quickly spread to North America and Continental Europe. In May 1894, Elbert Hubbard traveled to England and Ireland, visiting the Kelmscott Press and finding inspiration from their work. Hubbard had been a successful traveling soap salesman before beginning a career as a writer. 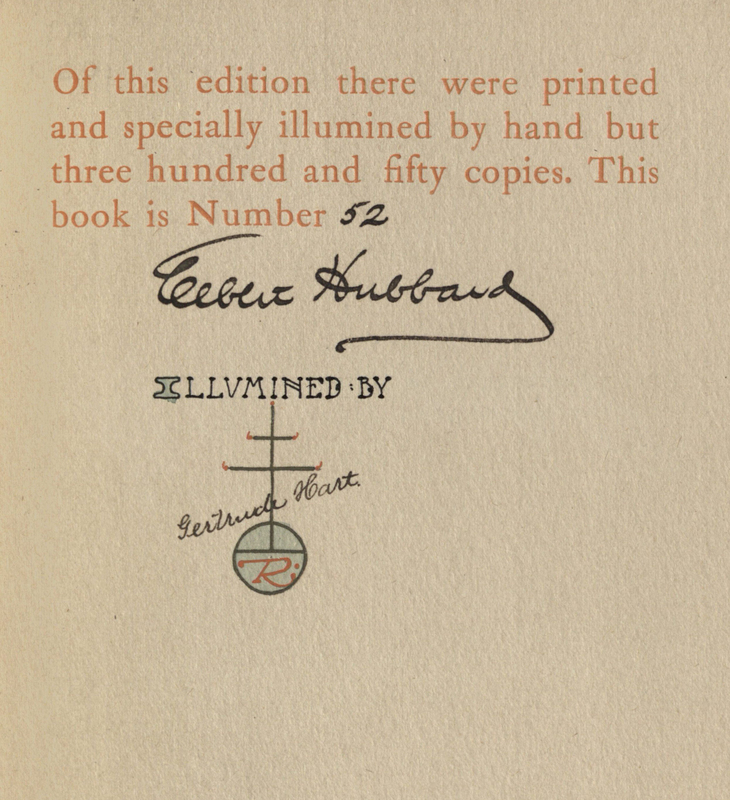 Unable to find a publisher for his work, Hubbard founded Roycroft Press to print his book himself. He selected the Roycroft name due to his admiration of 17th century London printers, Samuel and Thomas Roycroft. Although Hubbard expanded his Roycrofters community to include other craftspeople, such as furniture makers, metalsmiths, and leather smiths, this exhibition focuses on the work of the bookbinding and printing shops. Elbert Hubbard was very proud of the Roycroft bindery; advertisements written by him and printed in the endpapers of Roycroft books include praise of the German-trained master bookbinders Louis Kinder and Frederick C. Kranz. Hubbard himself collected fine bindings from some of the notable binderies of the late 19th and early 20th century: Riviere, Zahn, Zaehnsdorf, and Doves. A sample Doves Bindery bookbinding is in this exhibition. 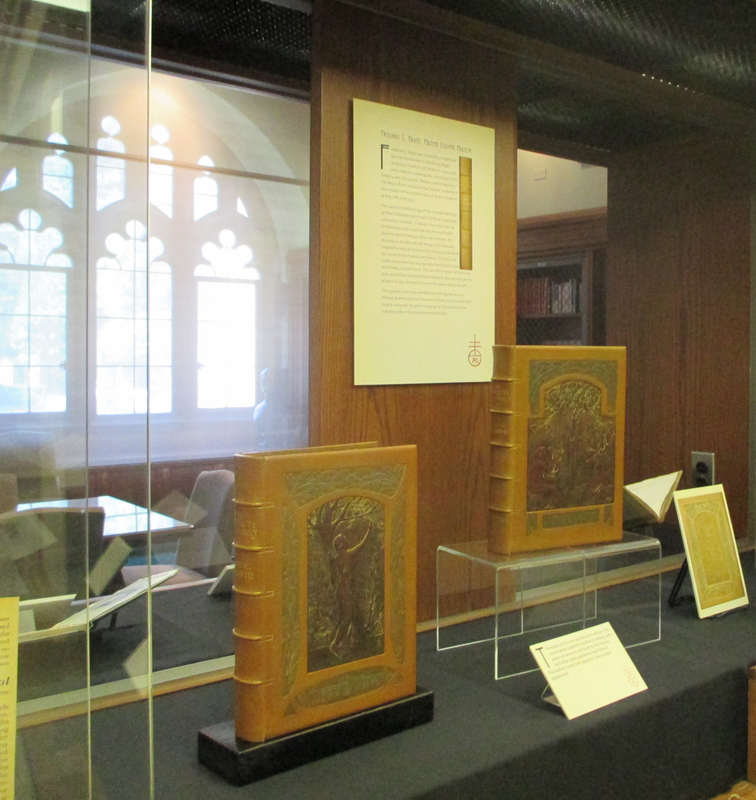 The Burns Library exhibition features an outstanding seven volume set of The Complete Writings of Elbert Hubbard, commissioned by Thomas W. Lawson (1857-1925), a wealthy Boston stockbroker and author. With the wealth Lawson amassed from copper mining, he built a vast estate; the manor house boasted a large library that once held these bindings. The beautiful, coppery-hued leather covers may be a nod to the source of Lawson’s wealth. These books were bound by Frederick C. Kranz, who had begun working in the Roycroft bindery in 1903, and, when leather modeling was introduced in the bindery, was designated “Master Leather Modeler.” The Lawson bookbindings reveal Kranz’s skills. 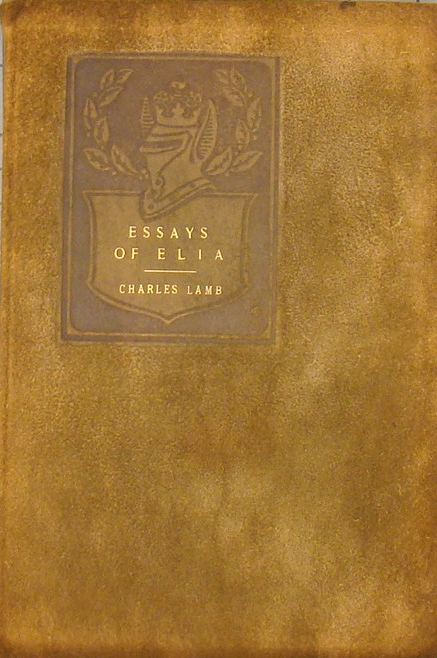 Kranz’s work was usually unsigned; his gold monogram on these covers may indicate pride in the exquisite workmanship. Hubbard, a perceptive businessman, was aware that not all potential customers were millionaires like Lawson. Little Journeys, a series of books written by Hubbard, was available in a range of binding styles and prices, with the most affordable produced in greatest numbers. Some of those styles displayed in the exhibition include: the most expensive, Joaquin Miller (1903), with a leather and marbled paper cover; the mid-range Pericles (1903), bound in cloth and paper cover; and the most affordable Plato (1908), with a cover made of unsupported printed-paper. Viewers will be pleased to know that, in addition to bookbindings, the exhibition also acknowledges fine printing, illumination, and handmade paper by the Roycrofters. Sonnets from the Portuguese (1898), an example of finely printed text, has been executed on handmade paper. The layout, coloring, and illuminated initials in this volume evoke the earliest printed books. The work of William Joseph “Dard” Hunter (1883-1966) can be seen in the beautifully designed pages of Woman’s Work (1908). Hunter, also known for his passion for hand-made paper, likely influenced the development of the “Roycroft” watermarked paper, which can be seen in the copy of The Essay on Self-Reliance (1908) in the Burns exhibition. Essays of Elia (1899),the book that piqued the curators’ interest in exhibiting Roycrofter materials at Boston College, is bound in suede leather with a heraldic cover design created by W. W. Denslow, famous as the illustrator of The Wonderful Wizard of Oz. The Essays of Elia chapter headings are graced with charming hand-colored initials. Hubbard encouraged women to work at Roycroft and to sign their contributions. The volume containing The City of Tagaste and A Dream and a Prophecy (1900) was hand-illuminated, or decorated, by Anna Paine and has her signature at the beginning of the text. 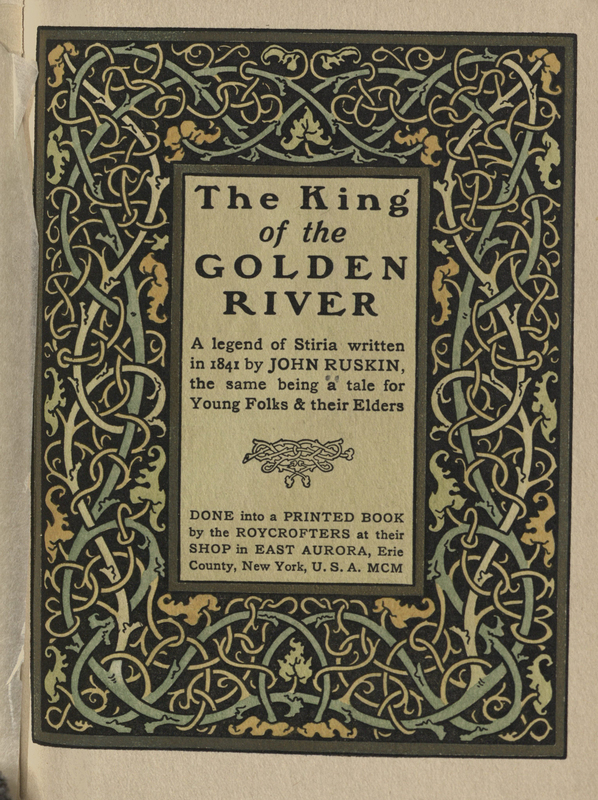 The King of the Golden River (1900) is an excellent sample of Gertrude Hart’s hand-illumination and contains her signature on the limitation statement. White Hyacinths (1907) has a beautifully illustrated title page designed by Alice Moore Hubbard (wife of Elbert Hubbard), featuring the Roycrofter font, along with a vine and floral motif. The tailpieces and initials throughout the book repeat that motif. Mrs. Hubbard was also an author, lecturer, and manager of the Roycroft print shop. Elbert Hubbard and his wife, Alice, died in 1915 when the RMS Lusitania was torpedoed and sunk by a German U-boat. After their untimely deaths, Elbert’s son, Elbert “Bert” Hubbard II, kept the press and bindery running until 1938. The quality of the work produced was less innovative than that made during Hubbard Sr.’s lifetime, as Bert often recycled old text block designs, initials, and decorations. The number of skilled bookbinders had also declined by 1915. Bert was not a writer, so he re-used the works written by his father. The Roycroft dreams of art and glory by no means were lost. Roycroft artisans trained and nurtured by Elbert Hubbard continued to influence the printing and binding communities: Dard Hunter became an authority on papermaking, W.W. Denslow was highly regarded as a book illustrator, and Louis Kinder’s Formulas for Bookbinders served to carry on the training taught in the Roycroft Trades School. The Hubbard legacy also lives on in the beautifully printed text blocks and handsome book bindings made by the Roycrofter artisans. A reception will be held Friday, September 14th in the Burns Library. Please visit this site to RSVP. This entry was posted in Exhibits & Events, Fine Press, Rare books, Recent Acquisitions, Staff Posts and tagged Alice Hubbard, arts and crafts movement, book arts, Bookbinding, Elbert Hubbard, Roycroft, william morris. Bookmark the permalink.